There's a new challenge starting today at Paper Creators. The theme is Anything Goes. I created this easel style birthday card for a neighbor who loves to plant flowers and work in her yard. This darling precolored digi image is called Polly's Pink Flower and it's available at the Paper Creator store. (Please note I flipped the image to face the other way.) Also used my Silhouette Cameo, Silhouette cut file 116484 (which I altered), picket fence cut file which was a freebie included with my Studio software, Spellbinders corner die from the Lace Hearts Set, Prima flowers, pop dots to mount the saying, buttons and polka dot paper I made with GIMP. Beautiful card Deloris lovely delicate colours and detail. So soft and sweet....I'm already ready for Spring. I want to case her. I bought that image years ago and now I can make something at it be pre-colored. 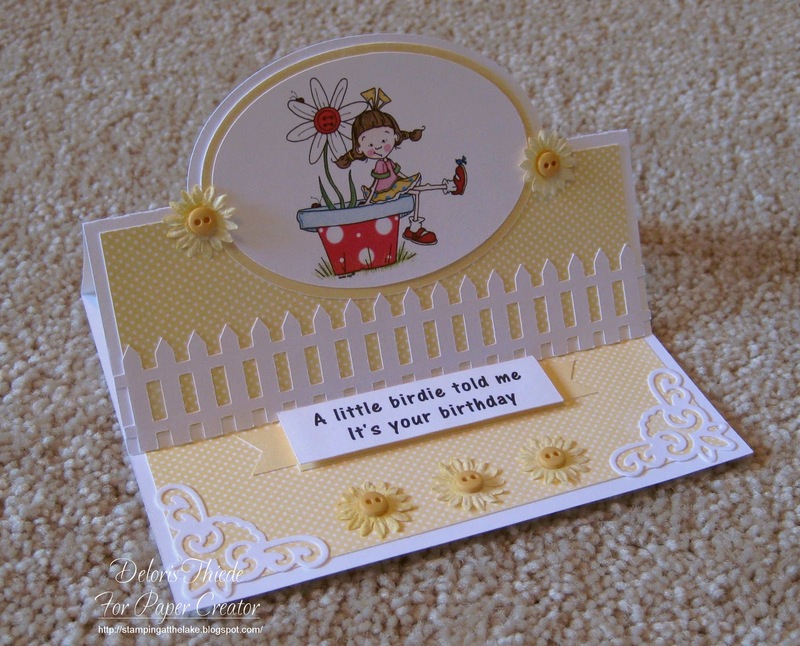 This is such a pretty card Deloris, a sweet image and lovely colours. Adorable card! Such a sweet image and fun design! !